Residents of this notorious neighborhood in upper Manhattan were astounded to find the buck with a single antler in Jackie Robinson Park for several days, reports NY 1 News. Parks Department officials told the New York Post they believe the deer may have crossed a bridge from The Bronx before swimming over a stretch of the East River into Manhattan. Since it’s December, wildlife experts believe the deer could be under the haze of love known as the rut. Its during the fall rut when bucks are in search of a mate and can typically find themselves in a bit of a haze of bad judgment. Haven’t we all been there? Early report suggested there could be 2 or 3 other deer in Harlem, but it seems this young stud won’t be finding a partner among the New York night life. 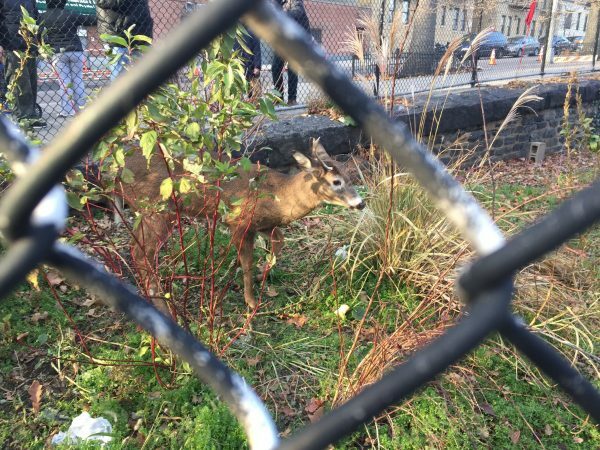 For now Parks Department officials are letting the deer find his own way home.